The potent ingredients and proven science behind Dr. Belter’s internationally known skin care products come together in the Intensa ampoule skin care line. Using natural ingredients such as Ginkgo Biloba, Ginseng, and Aloe Vera, the Intensa liquid skin care vials are skin care concentrates specifically formulated to address numerous beauty issues and skin situations. 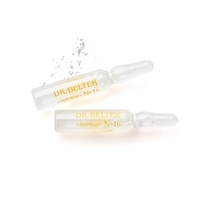 Dr. Belter’s beauty ampoules are a known miracle in skin care. The unique purity and high- dosage of incredibly effective natural ingredients allows the concentrated Intensa ampoule liquid to successfully redress skin issues. Perfect for either occasional or periodic application, Dr. Belter Ampoules have been proven to bring out the natural beauty of the skin and energize its radiance. We invite licensed skin care professionals to choose from the wide selection of specialized formulas created for specific skin care needs, from lifting and firming to regenerating and anti-aging serum ampoules. Dr. Belter’s line of targeted skin care liquid is potent enough to give your clients beautiful results fast. There’s no need to suffer through skin woes any longer thanks to Dr. Belter’s ampoules, available in the U.S. exclusively from Terry Binns Skin Care. Ginkgo biloba concentrate has a smoothing, firming, anti-oxidative and calming effect. This fresh formula is a spring of well-being for strained skin lacking moisture. Natural oils enriched with vitamins ensure instantly silky soft skin. Algae and sea extracts contain a multitude of highly effective substances. This special combination of high quality biological ingredients revitalizes and regenerates mature skin. The pure oil-rich ampoule soothes irritation and calms reddened, nervous skin. This product pampers and benefits particularly tender, sensitive or damaged skin. Champagne-Extract, OPC and red vine leaf extract are the exquisite actives of this concentrate. Damaged capillaries and oily skin with large pores benefit particularly from treatment. A particularly enzymatic peeling product, suitable EXCLUSIVELY for professional cosmetic treatment due to the application requirements This ampoule serum encompasses special plant complexes and key milk properties as a powerful shield. This ampoule is the perfect choice when you want to look fresh and youthful. Ampoule No. 15 - VivaCell-Grenadine (formerly Phytocell-Grenadine). Free and unhindered development is supported by this special formula. A blend of unique plant extracts gives ampoule Phytocell-Grenadine exceptional caring properties. In this quick-lift ampoule, hyaluronic acid is used as an endogenous moisture-binding substance to fill wrinkles, erase shadow and stimulate the skin. Special ampoule offers impure, problem skin highly effective and specific support for the regeneration of normal skin.